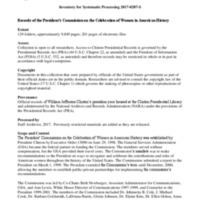 This collection contains the records of The President's Commission on the Celebration of Women in American History, established by President Clinton by Executive Order 13090 on June 28, 1998. The Commission was to make recommendations to the President on ways to recognize and celebrate the contributions and roles of American women throughout the history of the United States. The Commission submitted a report to the President on March 1, 1999. The President extended the Commission's term until December, 2000, for establishing public-private partnerships to implement the Commission's recommendations.